In this week’s issue of Metro Pulse, I preview the beginning of the Knoxville Symphony Orchestra’s new Q Series, a schedule of noon-time lunch concerts featuring its Principal String Quartet and its Woodwind Quintet. Read it online here. 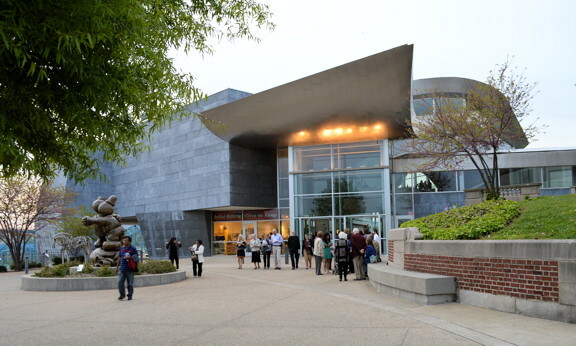 In the Classical Cafe blog at MetroPulse.com, I review last evening’s add-on event in the KSO’s Concertmaster Series at the Knoxville Museum of Art. That concert featured chamber music works of Rachmaninoff and Sarasate, plus Dvorák’s “American” String Quartet in F.
From its lofty perch on a bluff overlooking the Tennessee River in downtown Chattanooga, Tennessee, the Hunter Museum of American Art stands apart from its surroundings, and yet seems to have comfortably existed in that spot forever. At least, that is the impression of a first time visitor…as I was recently. My particular visit, though, was for something other than the notable collection—it was for the final music event of the season in a chamber music series called String Theory, a partnership between the museum and Lee University in nearby Cleveland, Tenn. The series, which has just completed its fifth season, is directed by the pianist Gloria Chien, who performs in many of the programs herself and is an Associate Professor of Music at Lee. However, it is Ms. Chien’s active connection to the professional chamber music world that has made possible the remarkable lineups of programs and artists that the series has enjoyed. Chien is an active recitalist around the U.S., a member of Chamber Music Society Two of Lincoln Center, the resident pianist with the Chameleon Arts Ensemble of Boston, and has recorded with violinist Joanna Kurkowicz and clarinetist Anthony McGill. As a result, String Theory has developed a reputation and artistic gravity that would be the envy of much larger cities. This week’s memorable season finale, sans Ms. Chien on stage, featured the Johannes String Quartet who performed the Brahms String Quartet (op. 51, no. 2) in A minor. The quartet was then joined by violist Kim Kashkashian and cellist Marcy Rosen for the string sextet version of Arnold Schoenberg’s Verklärte Nacht. At first glance, I had some reservations about the acoustics of the museum area used for the performances—essentially, a triangular space with floor to ceiling windows on one side (affording an amazing view) that meet an adjacent wall at a sharp angle behind a performance riser. But, I shouldn’t have worried. The riser provided a substantial resonance boost for the cellos on this occasion, while the angled window wall countered with a bit of bright reverb for the other strings, together giving the quartet and the sextet a sound that was warm, but with a surprising clarity. Although the space worked well sonically, the visual impact and distractions of the window wall and approaching twilight were all too apparent once the novelty of it wore off. Of course, concerts during the earlier darkness of the winter months would avoid this issue. Still, sightlines are a bit of a problem, given the flat floor, whatever the season, preventing those in the rear two-thirds from easily seeing the players. The performances at this week’s concert, though, were enchanting. The quartet (Soovin Kim and Jessica Lee, violins; Choong-Jin Chang, viola; and Peter Stumpf, cello) opened with the Brahms and immediately set a tone of measured Romantic cheerfulness that fell perfectly into the expressive sweet spot between the extremes of dry severity and over exuberance. While the second movement has the ability to seem too long in the wrong hands, the quartet gave it an interesting ebb and flow between moments of drama and serenity. By the finale, one is ready for some intensity and fun and gets it with a bit of Hungarian flavor vaguely reminiscent of the drama of the final movement of the Brahms opus 25 piano quartet…Altogether, a deeply satisfying interpretation. At least to those of us 115 years later, Schoenberg’s Verklärte Nacht captures the essence of fin de siècle Europe, where confrontations with sensual pleasure were but one aspect of the fading of the 19th century and the simmering of revolutionary thought in art, music, and society—in other words, the transition from Romanticism to 20th Century modernism. The sextet took on the work with intensity and gave it an emotional depth that, in my opinion, the later string orchestra version simply can never have. The group was able to beautifully explore both the density and lightness in the piece that comes from distinct voices, emoting musically, becoming alternately viscous or transparent. And one cannot ignore the romantic poignancy of the work that was lovingly captured. String Theory has announced its sixth season of six events, beginning in October with pianists Leon and Katherine Jacobson Fleisher. Other events include the Pacifica Quartet, clarinetist Anthony McGill, and, of course, Ms. Chien. As I settled into a seat in the Powell Recital Hall Thursday evening for the Doric String Quartet, I admit I was unsure what to expect from the ensemble. Although I was familiar with their reputation, the range of guest performers in the UT School of Music’s visiting artist program has–as one would expect–varied wildly from acceptable academic average-ness to the famous and absolutely splendid. I can say, most joyously, that the Doric String Quartet belonged to the latter group and raised the splendid end of the bar quite substantially. Their program of three works represented three distinct areas of repertoire–Haydn’s “Emperor” Quartet (Op. 76, No. 3), Korngold’s String Quartet No. 2, and Beethoven’s Op. 127 String Quartet. In all three works, I was impressed by four things: impeccable intonation, carefully nuanced textural balances, detailed interpretative statements, and a stunning liveliness across all tempos. This combination accomplished a level of musicality that all musicians strive for, but few manage to attain. I was particularly impressed by the not-often heard Korngold #2, the final Waltz movement of which had a degree of small ensemble excitement that one rarely experiences. The second half of the program was devoted to the beautifully descriptive Beethoven ; I must confess that it seemed a shame that a work of such complexity and depth could not be appreciated with fresh ears. My review of Sunday’s Knoxville Symphony Chamber Orchestra concert (Mendelssohn’s Piano Concerto No. 1 with pianist David Brunell, Stravinsky’s Pulcinella Suite, Respighi’s Ancient Airs and Dances Suite No. 1, and Rossini’s Overture to L’Italiana in Algeri) is online at MetroPulse.com. James Fellenbaum conducted. The issue of good performance spaces for chamber music is an easy one to disregard until the awareness sets in that the growth of a classical music scene inevitably depends on it. In this week’s issue of Metro Pulse, I focus on two recent chamber music events (KSO’s Concertmaster Series at Remedy Coffee and UT School of Music’s Faculty Chamber Series at the Powell Recital Hall) through the lens of Knoxville’s small ensemble music spaces, or lack thereof. Read it online here. As always, thanks for reading. After settling into a seat in the University of Tennessee’s smaller performance hall for a recital of the Formosa Quartet, I perused the bio section of the program, reminding myself of the quartet members’ other activities. Cellist Ru-Pei Yeh, one of the founders, has returned to the group, but still maintains a roster position with the New York Philharmonic. The ensemble’s newest member, second violinist Wayne Lee, a member of the Manhattan Piano Trio, joined the quartet in 2012, taking the position that founder Joseph Lin held. Lin has subsequently become first violinist for the Juilliard Quartet. First violinist and founder Jasmine Lin and Joseph Lin are not related, although such a complication would have suited my point. Violist Che-Yen Chen was principal viola for the San Diego Symphony for eight seasons and is currently the principal violist for the Mostly Mozart Festival Orchestra. A day earlier, I found myself contemplating the concert of the KSO’s Principal Quartet for a review and making a pointed distinction between “dedicated” quartets (such as Formosa) and ensembles that spring, by definition, from larger organizations. Perhaps I have been too hasty in stating that group stability is such a positive asset. This ensemble seems to thrive somewhat on the volatility of busy careers and diverse music endeavors. The three works on the program couldn’t have been more different, but the gamut certainly provided a good look at the ensemble’s marvelous strengths–impeccable intonation, razor-sharp attacks and dynamics, and satisfying resolutions. First violinist Lin’s energy, at times chair-hoppingly frenetic, seemed to drive the ensemble, not at all unpleasantly–although at least in a recital hall unfamiliar to them, this pulled the overall balance toward the treble side away from solid quartet resonance. In the opening work, Haydn’s Op. 64 No.2 Quartet, the energy added an unexpected layer of depth, although I didn’t really sense the inevitable spontaneity of a live performance. Perhaps, by the end of the day of guest artist work at the School of Music, weariness was a factor. I rather enjoyed the middle work, a work commissioned by the ensemble, Dana Wilson’s Hungarian Folk Songs…but for maybe the wrong reasons. The work uses a lot of pizzicatos, micro-tones, glissandos, tone bending, and frantic rhythmic escapades to simulate the flavor of Hungarian folk music, all of which are exciting, entertaining, and, in the end, amusing, but not particularly revealing in any major way other than technique. UT music faculty members Hillary Herndon (viola) and Wesley Baldwin (cello) joined the quartet to conclude with Tchaikovsky’s String Sextet in D minor, “Souvenir de Florence.” In the work, one is instantly reminded of the enthusiasm and spirit the composer is capable of, even in a minor key. One is also reminded of the composer’s affinity for a rapturous string sonority, reminiscent of his Serenade for Strings. Particularly noteworthy was the gorgeous slow Andante cantabile movement and its countering of subtle passages between the violas and later the cellos. The finale movement was everything energetic chamber music was meant to be.